When hosting a party, plan to serve food you can prepare in advance. Everyone will want to talk to you, and you don't want to be stuck in the kitchen rolling sushi and missing your own party. Slice tuna into very thin, bite-sized pieces and place on a tray. Cover well with clingwrap until half an hour before serving. - Mix together the soy, mirin, sesame oil and chopped ginger and set aside. Puree the peeled avocado with lime juice, salt, pepper and a small amount of wasabi paste. Start with a 1/4 teaspoon - it is very hot - and add a little more if desired, to taste. Cover with clingwrap, pressing the wrap down on the puree to make it airtight, and store in the fridge until ready to use. This can all be done the morning of the party. Half an hour before serving, pour the soy marinade over the tuna pieces and continue to refrigerate. 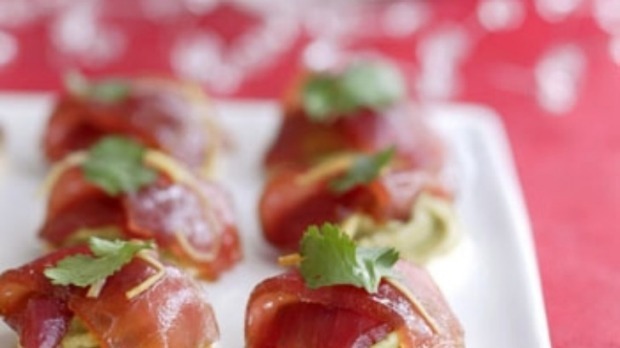 To serve, simply dollop a little of the avocado puree on a Japanese rice cracker and place a piece of tuna on top. Garnish with coriander leaves if you like and serve.